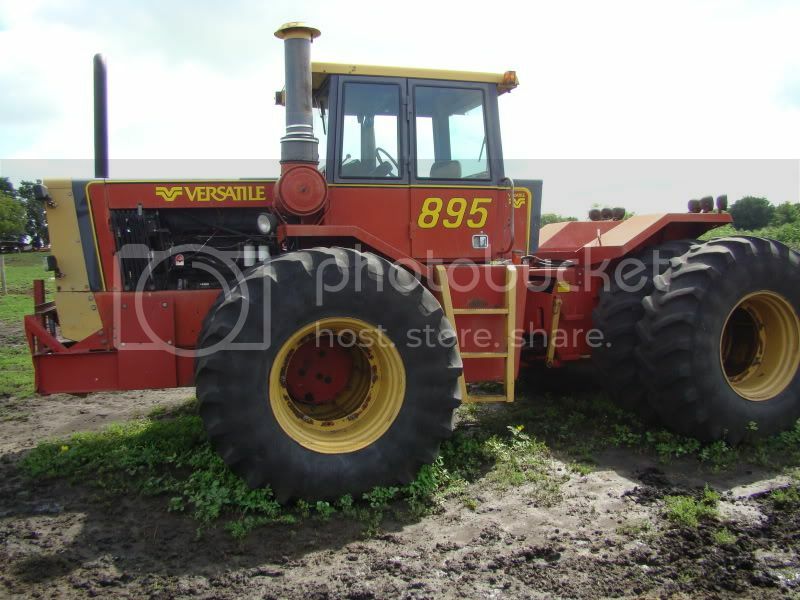 The Versatile 895 was the first new tractor model to be introduced by Versatile in the 1980s. Produced from 1980 to 1984, this farm tractor was a four-wheel drive with a 310 horsepower diesel engine. Unlike many other tractors, all of the wheels on the Versatile 895 were the same size. It also had articulated steering, which was mass-produced on four-wheel drives for the first time by Versatile in 1966. The Versatile 895 used a six-cylinder Cummins engine that was run by diesel fuel. The engine had a displacement of 855 ci, or 14.0 liters. This particular model, with its large diesel engine, had more power and torque than the typical farm tractor. The 895 had a transmission with twelve forward speeds and four reverse speeds. When running 2100rpm in first gear, the tractor would move at 2.6mph. At 2100rpm in twelfth gear, you could get up to 15.2mph. With a dry weight of 24,400 pounds, the 895 is a larger tractor, and was designed with large farming areas like the American Midwest and Canada in mind. With all of the needed liquids, the Versatile 895 weighs 32,500 pounds. Measured to the top of the cab, the height of the 895 is 126.75 inches, or a little over ten and a half feet. The Versatile 895 has a width of 152 inches (12.67ft), and a length of 253 inches (21.08 feet). Do you know if there is a company that makes tracks for this tractor .